Families have been enjoying Lake Corpus Christi State Park for more than 80 years. Come for the water sports, varied wildlife and relaxing atmosphere. Leave refreshed! On water, you can swim (no lifeguards), paddle, fish, boat, and water ski. On land, you can camp, hike, bike, geocache, and bird and nature watch. Rent one of our pavilions for your next gathering. Fish in the 18,256-acre Lake Corpus Christi. Anglers pull in largemouth and white bass; crappie; blue, channel and flathead catfish; and bluegill and redear sunfish. 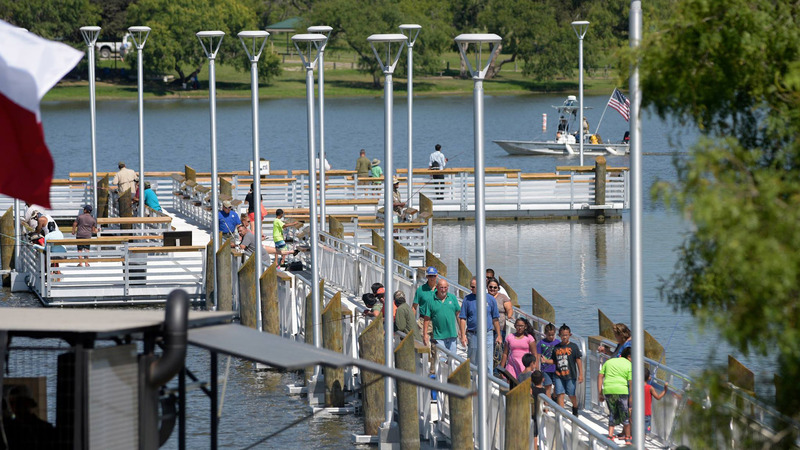 The park has two lighted fishing piers, one of which is 400 feet long and wheelchair accessible. We also have two boat ramps and two fish cleaning shelters. You do not need a fishing license to fish from shore or pier in a state park! Stay in one of our screened shelters, cabins or campsites. Choose from a basic campsite with water only, sites with water and electricity, or full hookup sites (with sewer). Birding is rich and diverse here. This area is an important stopover for Neotropical migrant birds. We’ve identified more than 200 bird species in the park. Learn more on our Nature page. Paddle on the lake! Bring your own, or rent a kayak or paddleboard; you can reserve your rental up to one week in advance from the PaddleEZ website. Civilian Conservation Corps: CCC Company 886 built several buildings and bridges here, as well as Park Road 25, in the mid-1930s. The only structure remaining today is the refectory. Learn more on our History page. The park offers programs throughout the year. Check the Events page for upcoming programs, or contact the park to arrange a special tour for your group. Visit the bustling bayside town of Corpus Christi, with its many restaurants and museums. Padre Island National Seashore protects 130,000 acres of natural barrier island. Explore the Brush Country Loop of the Great Texas Wildlife Trails to see the best places to view wildlife in this area. January average low is 44 degrees. July average high is 94 degrees. Wettest month is September. First freeze occurs mid-December. Last freeze occurs mid-February.